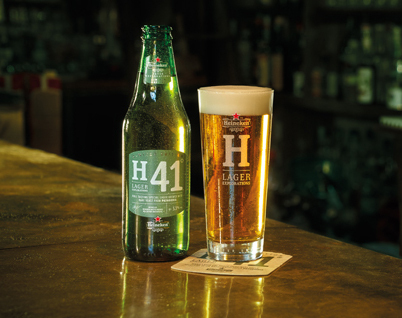 In 2016, Heineken released a limited edition beer called H41 as part of their Lager Explorations series. Haven’t heard of H41? That’s understandable – it was only released in the Netherlands and Italy. When I first hear about the beer I was rather intrigued because this isn’t just another Heineken. This is Heineken fermented with Saccharomyces eubayanus. In what seems to be a departure from the norm at Heineken, they decided to explore some creativity by becoming the first commercial brewer to use S. eubayanus. Heineken purchased the patent rights to brew with S. eubayanus in 2015. This was indeed a bold move, as there was no precedent for brewing with this yeast. But “Using [their] unrivalled expertise, Heineken®’s Master Brewers began to work with the mother yeast to unlock a spectrum of new flavours.”, according to their press release. (I guess their unrivaled expertise means first killing the yeast.) Heineken managed to break their own mold to make a unique beer that they describe as a “new lager has a fuller taste, with spicy notes balanced by subtle fruity hints”. Sounds like eubayanus to me. For quite awhile I was dying to get my hands on a bottle of this beer, but with no trips to Italy or the Netherlands coming up I figured it would never happen. However, I was talking to a colleague about his upcoming vacation and it turned out he was traveling to Italy, at which point I not-so-subtly asked him to keep an eye out for H41. Much to my surprise and delight, upon his return there awaited a three-pack of H41 in my cubical. After a seemingly long day at work, I rushed home and cracked open a bottle. It poured like a Heineken (nice white head), it looked like a Heineken (clear golden color), but it didn’t smell or taste like Heineken. The aroma was unrefined, almost a little musty and unmistakably S. eubayanus. The mouthfeel was medium-bodied – more so than most light lagers – with medium carbonation. The flavors were very similar to the eubayanus beers I had previously brewed. It was slightly phenolic and spicy with an ester profile not typical of any ale or lager yeast I’ve ever tasted. There was some apple/pear fruitiness unique to most eubayanus beers with a somewhat rustic flavor shared by many saison yeast strains. Basically, it tasted like Heineken fermented with S. eubayanus. H41 was a well brewed beer that highlighted the desirable flavor profile of S. eubayanus. Will it be a global sensation? I doubt it. It is definitely a novelty beer and one worth seeking if you get over to Italy or the Netherlands before they discontinue it.